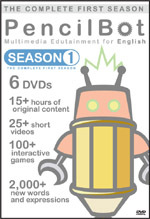 PencilBot™ DVD series is designed for learning English as a second language (ESL). Each issue combines a communicative and situational approach to learning English with entertaining multimedia content that effectively integrates language, culture, and knowledge. PencilBot™ focuses on authentic language use to facilitate learning and supplement middle-and high-school ESL curricula. PencilBot™’s material is primarily based on American English, with related elements of British, Australiian, and Canadian English. Each issue of PencilBot™ features short theme-based videos, listening exercises, and interactive games to increase knowledge of the English language, improve listening skills, and teach new vocabulary. Topics such as sports, arts and daily life activities provide exposure to cultural aspects of English-speaking countries around the world. By consistenly using PencilBot™, learners will significantly increase their ability to use English in a practical, effective, and natural way. PencilBot™ is designed primarily for middle-and high-school ESL students and teachers, but anyone learning ESL or interested in improving English skills will benefit from PencilBot™’s multimedia collection of fun and challenging games. Each issue of PencilBot™ contains three skill levels. Users can start at any level and work through the games and activities to unlock hidden features. PencilBot™ makes learning English fun and effective!